The Feelfree Overdrive is the modern evolution of pedal and powered kayak propulsion offering effortless speed, ease of use and adaptability. Designed to be retrofittable on most Lure 11.5, 13.5, and Lure II Tandem, the Overdrive is the only two-in-one system that offers forward and reverse pedal or power driven capabilities in one single unit when paired with the Motordrive. Engineered to last, the system is manufactured using cast aluminum and finished off with heavy-duty components. Paddle, pedal or power, the Overdrive system gives kayak anglers and recreational paddlers the flexibility to Feelfree all day long no matter where they choose to have fun! This is a retrofit accessory and you will need additional accessories to complete the installation. Please see the attached chart and find the boat you have to see what additional parts are needed. If you have any questions on this installation or what parts you may need, reach out to our customer service team or nearest store location. 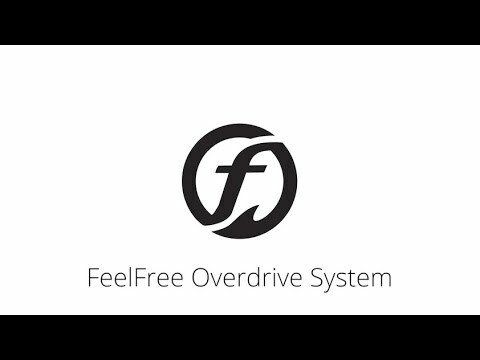 FeelFree Overdrive: What Do You Need? Q: Does it come with the rudder system too? A: No, the rudder assemblies are sold separately. Q: Where do I get spare props? A: We do not stock the spare propellers for the FeelFree overdrive, but we can special order it for you. If you are interested in doing this, please email us at customer@austinkayak.com or call us at 888-828-3828! Q: What is the weight of the overdrive pedal system (without the motor)? A: Hey there, thanks for the question. The pedal system weights about 25 pounds. Q: Can this be installed on a Moken 10? A: No, this will only work on the Lures with the removable console. Q: This is just for the "FF Overdrive" pedal. This does not include the motor, where is that part listed? A: The Overdrive system with the motor has not been released for purchase yet, so we do not have it on the website yet. If you have any other questions please let us know! Q: Can the pedal drive,seat adjustment and rudder hand control be installed by Austin kayak?If so how much will it cost? A: As it turns out, we cannot install the Overdrive due to risk of damage in shipping.